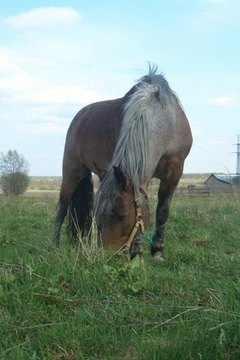 Systemic toxemia is a secondary disease in horses suffering from other diseases. A common cause of systemic toxemia is the release of toxins from bacteria. This condition needs prompt treatment to prevent the death of the horse. Toxemia occurs when toxins are released by bacteria into the blood stream or when body tissues break down due to severe injury or disease. Many diseases can lead to systemic toxemia in the horse. Infectious diseases, such as pneumonia, colitis, peritonitis and abscesses, can release bacterial endotoxins into the body. Severe intestinal trauma can release toxic bacteria into the bloodstream. Signs of systemic toxemia include shock, pain, low blood pressure, disseminated intravascular coagulation (blood clotting problems), laminitis (hoof inflammation) and death. Most horses are seriously ill when toxemia occurs and may not be able to stand due to the proceeding problems. Treatment for systemic toxemia will depend upon the initial cause of toxemia. Corticosteroids and anti-inflammatory drugs will be used to help control pain and to reduce inflammation. Fluids may be given via an IV. Antibiotics will be used to control infection. Despite intense treatment, many cases of toxemia will not have a favorable outcome. Prevention of toxemia is not always possible, but keeping horses up-to-date on vaccines, preventing injuries, and getting prompt treatment for illness will help reduce the chance of systemic toxemia from occurring.